The MK-CE from Kala Kala is an entry-level Makala Series Concert Ukulele with a PS-900 EQ (passive system). 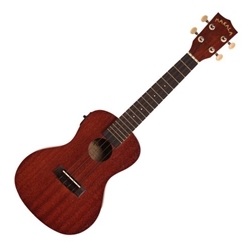 It has an agathis body and mahogany neck, and a rosewood fingerboard and bridge. The instrument can be used by musicians and students in recording studios, rehearsals, for playing at home, and more. The MK-CE has a powerful sound. It is built with 18 brass frets and has geared tuners to ensure it stays in tune. Additionally, the instrument's built-in electronics feature a Makala PS-900 system, which includes volume control and a 2-band EQ for tone control. It delivers a clean and natural sound. Featuring a satin finish, this instrument is attractive, and is appropriate for the beginner or professional performer.